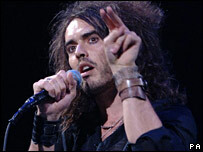 Comedian and BBC Radio 2 host Russell Brand will present next year's Brit Awards, which will be broadcast live on TV for the first time since 1989. The ceremony will be held at Earls Court in London on 14 February. Oasis will receive an award for their outstanding contribution to music, and the British single of the year will be decided on the night by viewers' votes. The last time the awards went out live turned into a famously shambolic night with Samantha Fox and Mick Fleetwood. The programme was widely considered a disaster, and the decision was taken to record subsequent ceremonies and screen them on TV a day later. A total of 13 awards will be handed out at the event on St Valentine's Day. These will include the best male and female acts from the UK and internationally, and the best "breakthrough" - or emerging - talent of the past year. The nominations will be announced on 16 January. Last year's ceremony was hosted by another BBC Radio 2 DJ, Chris Evans. It saw James Blunt named as best pop act, the Arctic Monkeys winning the breakthrough prize and Coldplay's Speed of Sound taking the single of the year award.